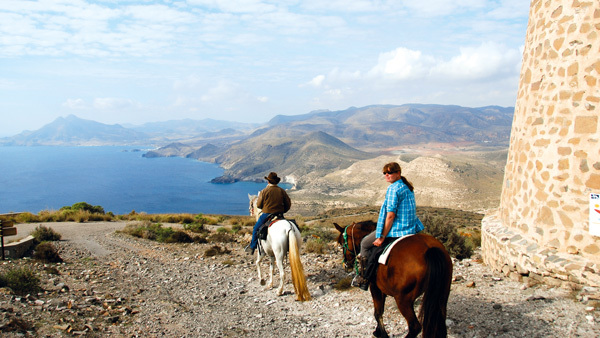 This trail programme runs through the Natural Park of Cabo de Gata-Nijar. It combines routes along the coastline with riding through valleys further inland where you can find beautiful scenery and small, unknown villages. 7 nights, 6 days riding, 5-6 hours per day. After breakfast, you will be allocated your horse for the week and have your first chance to ride in the arena in order to get to know each other. Set off riding through the Rodalquilar valley, which used to be a prosperous mining settlement (for gold!) and the source of many great pirate battles. Follow a narrow path alongside the coast - these roads were once used for coastal surveillance to prevent pirates from landing, and you can see the small castles and watchtowers. Ride along the famous El Playazo beach with its golden, crystalline sands, crowned by the castle of San Ramon. Picnic lunch is by the sea and dinner/overnight is in Rodalquilar again. Today you ride along beautiful paths near to the seaside. From here you can enjoy spectacular views from the sea and the amazing cliffs. This is the best vantage point to enjoy such incredible scenery. At midday, you will enjoy a picnic lunch on the Escullos beach, amongst the oasis of palm trees at Isleta del Moro. In the afternoon continue riding along the beach to San Jose where you have dinner. Overnight at the hotel Cortijo El Sotillo. Today you ride through the western side of the national park, which covers nearly 3500 acres. Here you will find some of the last virgin beaches on the Spanish coastline at Genoveses and Monsul. You can see white sand dunes which were used as the setting for famous films including 'Indiana Jones and the Last Crusade', 'The Adventures of Baron Münchhausen' and 'Lawrence of Arabia'. At midday stop for a picnic lunch in Cortijo El Romeral, where farmers and shepherds still gather. Then continue riding uphill through El Tesorillo valley and back to San Jose. In the north face of the park you find the mountains of "Sierra de Gata" which still have the craters of ancient volcanoes and a moon-like scenery. You can visit unspoilt villages such as "Los Albaricoques" where you will again discover the scenery of many western movies, and where you will be able to enjoy a delicious Andalucian picnic lunch. In the afternoon, you will ride on an old gold mining path and head for "Cortijo del Fraile", made famous by the film "Bodas de Sangre" (Blood Wedding) by Federico Garcia Lorca. Dinner and overnight at Cala Grande or similar, which has a spa, sauna, jacuzzi etc on offer - subject to additional payment locally. Today's ride heads inland to cross the old gold mines and climb through ravines which formed the only connection between the farms. Ride through the crater which forms the Rodalquilar valley and discover mineral walls where hidden gold may still be present! You can visit the old mine facilities which were in operation from 1933 until 1986. In the afternoon you arrive back at the Hotel Cala Grande where you can enjoy the spa (sauna, steam room, jacuzzi etc) before dinner in a local restaurant facing the sea. On the way back to Las Negras you ride past vegetable gardens which are irrigated by water flowing from Rambla de las Aguilas, which gathers in a series of pools near the sea. The village of Las Negras comprises a group of simple white houses on the coastline. From here you take the path that leads to San Pedro Cala which has some impressive ecological features. Dinner and accommodation at the hotel. Day 8. Breakfast and departure.